The Barluga marketing people weren’t too happy with my last review. 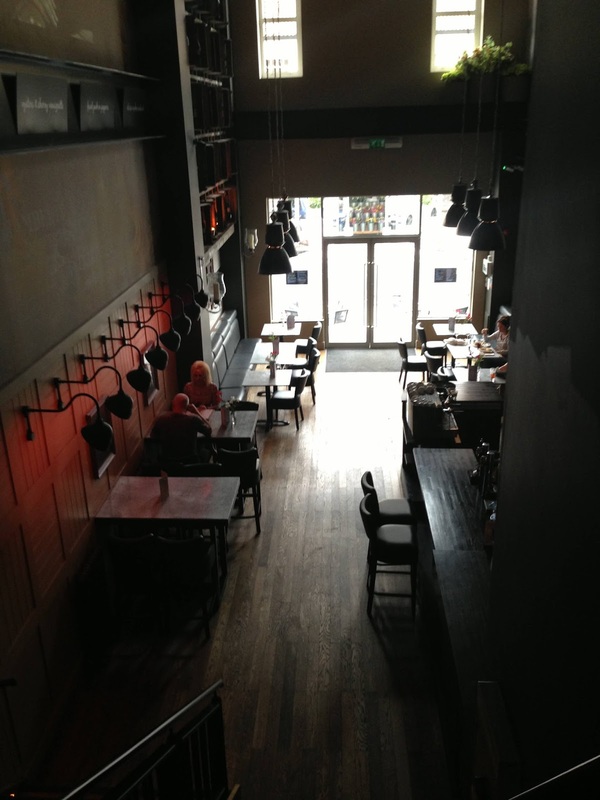 They describe their Grey Street establishment in Newcastle as a “sophisticated gastro pub”. I didn’t agree. “Gastro it most certainly ain’t,” was my verdict. They took my criticism on board, rewrote the menu, then invited me back. I duly went, but nothing much had changed. The menu is far too big, so the cooking can’t keep up. It’s a bar with food, but no one should go there just to eat. They have a second gastropub in Morpeth. It has a prime position in the Sanderson shopping arcade, and I like the modern design. It’s like a three storey library, with wine racks instead of books. We went for a late lunch. At 2.45pm they might not have a full brigade in the kitchen, but they still offered the full menu: 15 main courses and 13 starters, plus sandwiches and other stuff. They wanted to charge up to £20 for a main course, so I wanted to test it. We went easy on them: I ordered smoked haddock with poached egg, Mrs Diner wanted a club sandwich, and the children had fish fingers. I also asked for a glass of the house Pinot Grigio. They didn't have any. Sold out of the only house white? It was replaced by a poor Sauvignon Blanc, which I sent back. The only other choice was a Viognier-Marsanne blend, which was fine. These were the only whites by the glass, which is inadequate for any bar calling itself gastro. The fish fingers were good, but the club sandwich arrived as a hamburger. Quite why, we never found out. Served on a board, it looked like one of those dull pre-prepared burgers you aren’t allowed to have medium rare. We sent it back and waited for the club sandwich we'd actually ordered. 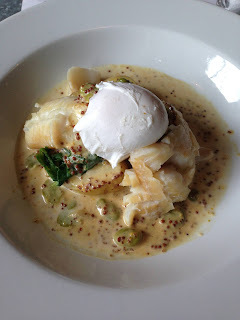 Meanwhile we shared the smoked haddock, which sat with a poached egg on bouillon potatoes swamped by runny grain mustard sauce with a few broad beans that had lost their colour. The fish was fine. Much later, the sandwich arrived, with good mayonnaise, but on white sliced bread that hadn’t been properly toasted. It looked like a bacon sarnie from a greasy spoon. I reckoned it wouldn’t be fair to review Barluga based on this one bad experience, so, three weeks later, at the same hour, we traipsed back to try again. The Diners are a very tolerant family. The children wanted fish fingers of course, but I told them they were having pizza. We arrived carrying coffees from Barluga’s neighbour and sister, Central Bean. That’s what we do in shopping malls – sip coffee as we browse. It took an age to get a menu. Then we tried to order, but no one noticed. Staff were busy polishing and gossiping. Eventually someone came, not to take our order, but to chastise us for drinking someone else’s coffee in their restaurant. Even though the drink came from the same Fluid Group chain. This was so rude, I needed a glass of wine to calm down. Pinot Grigio was still listed as the house white, but again they had none. The waiter recommended the Sauvignon Blanc. I told him he had no idea what he was talking about, and ordered Viognier again. It was time to take the gloves off. 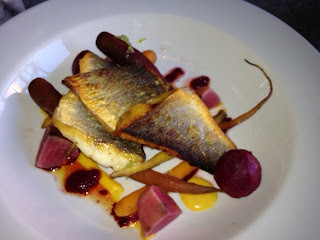 Mrs Diner ordered sea bass at £14.95 with baby root vegetables and beetroot. 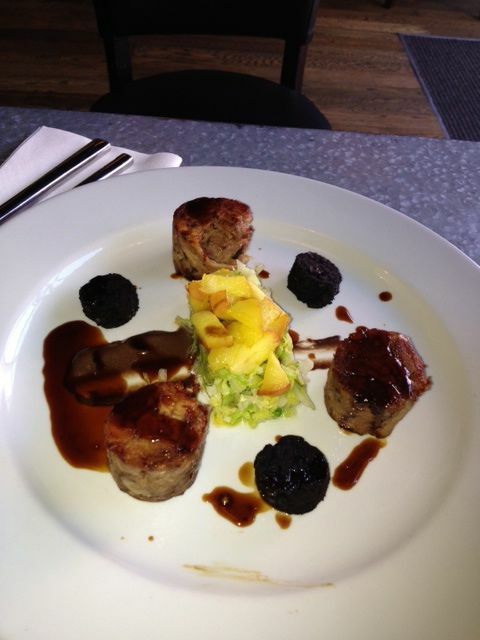 I selected slow-cooked shoulder of pork, with sautéed apples and boudin noir. This for £13.95. It was far more than you should ever pay for lunch in a shopping mall, but this was a gastro bar. So: gastro us then. Mrs Diner’s food was barely edible. Reasonably good fillets were plonked onto roasted baby carrots and parsnips so raw you could scarcely bite into them. They all had to be left on the plate, together with some unpleasant beetroot that had been vinegared to death. My pork was shredded, with sage, into little towers, with roundels of overgrilled boudin noir around a mound of savoy cabbage and warm eating apple. Some cidery jus had been squirted around, and underneath the hill was a smear of something indecipherable caked into dried mud. It was a dish you might see in the first round of Masterchef. From a losing contestant. But this was gourmet compared to the children’s cheese and tomato pizza. What arrived was a bread roll smeared with tomato and cheese. I kid you not: an ordinary bread roll, cut in half, pretending to be a pizza. I have never seen anything like it. We paid £40 for this travesty of a lunch, then walked back to Central Bean for a sandwich. I heartly disagree with the majority of comments raised in this review. 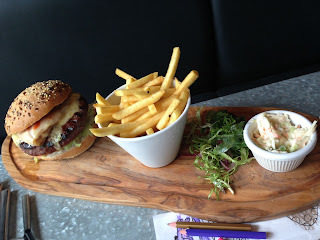 Being a residident of Morpeth, Northumberland, I visit Barluga regularly and have enjoyed every meal i've had, especially the Barluga burger which is one of my favourites. I honestly think the food is delicious and up to a high standard both at Morpeth and at Newcastle. We have had parties and quiet meals/ drinks and all have been successful and an enjoyable time. I have dined there with children and I have too ordered the children's cheese and tomato pizza, however i read the menu properly and it does actually state that it is a muffin pizza and not an Italian base pizza, so there was no false advertising as you are trying to make out in the review above. This is of course a North East traditional recipe that I remember making as a child, except we made it with a Stottie and I have to admit I still even prefer to eat this version to the Italian version. Every child who has eaten this in my company has thoroughly enjoyed it. As for taking your coffee from Central Bean to Barluga and thinking this is acceptable is beyond me. Yes they are sister companies but they are different premises. Both Premises will have their own targets to reach let alone seats for their own customers. If every person bought their coffee at Central Bean but decided to drink it at Barluga, Barluga would certainly lose money and also there would be nowhere for the Barluga customers to sit, (and vice versa). If you knew you where going to eat at Barluga, you should have prehaps bought the coffee there instead, or finished your coffee at Central Bean beforehand. Also you could have maybe asked Barluga if they minded you drinking your coffee indicating your intentions to eat there before assuming it was acceptable, it might have saved the waiter the awkward conversation of 'you cannot drink that here' and saved you the embarrasment of trying to get away with it. I would never dream of buying a coffee at Starbucks next to Central Station and think of finishing it at Eldon Square branch. It's just not done, I think the majorotity of people would agree. I do agree that the service at Barluga is very slow, and have raised this complaint with the manager on two occasions. I still think there is room for improvement. I also think that it is unacceptable to run out of house white at that time of day and think that Barluga need to look into the reasons why this is happening. However I also think that this reviewer is being overly harsh in critising one of the nicest restaurants in Morpeth and feel that they are critising for critising sake. I sincerely hope that this will not discourage people from visiting this restaurant along with the other restaurants we have in this beautiful town. I for one am not put off by the overly unjust comments made in this review, and can promise Barluga I will certainly be back. It's a shame you want to remain anonymous, or I could have used some of your comment in the Journal next week. I don't know what you mean by "muffin pizza". The menu doesn't say this at all: see http://bit.ly/17e8qUe - it's just lazy cooking. As far as I could tell, they wanted to sell a pizza without bothering to make one. It wasn't an English muffin or a Stottie either, it was a bread roll, as I said. It was advertised as a pizza, and arrived as a roll. That is unacceptable. As far as the coffee was concerned, it wasn't that we were drinking it in the restaurant, it was that the service was so bad that we were totally ignored from the moment we walked in, and the only approach we had from a waiter was to reprimand us for bringing in coffee from another company in their own chain. The waiter's priority was our coffee, not serving us. Any restaurant that knows what it's doing should greet every diner at the door, take them to a table, give them a menu and ask them if they'd like a drink. It's basic stuff. None of this happened - on both our visits. You're right that the service is very slow - it's also truly amateurish. I don't blame the untrained young waiting staff, but they shouldn't be charging £14-20 for a main course for this standard of service. As to the food: the pictures I published speak for themselves. 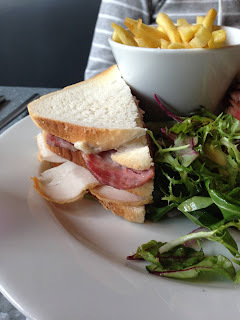 Look closely at the club sandwich - and try to tell me this is acceptable. Look at the pork, and tell me this is proficient plating - it's a mess. Look at the fish, and the raw beets, and tell me we should be paying nearly £15 for this. If you think this is good food, you should get out more. And as to the house wine: they didn't run out of house wine "at that time of day". They ran out of house wine, and three weeks later had still not replaced it. According to my correspondents, they still haven't. This is unacceptable - aside from the fact that 3 choices of wine by the glass is pathetic for any wine bar in 2013. Lazy, inefficient management is what lies at the heart of my criticism, which starts front of house, and ends with the kitchen, which, after 2 separate visits, leads me to believe that they can't cope with their own overblown menu, even when the restaurant is nearly empty. I went twice because I believe the North East deserves better, that local businesses deserves support, and I was prepared to give the place the benefit of the doubt. I wouldn't have done that for a national chain (see the Carluccio's review). Even second time round I couldn't find a single dish that worked or was remotely value for money, apart from my children's fish fingers. And that is really sad. This isn't criticism for its own sake: take a look at my other reviews, where you'll see that around half have 3 stars or better. I am the biggest supporter of the local, and the excellent. But I owe it to my readers to tell them the truth, rather than being a public relations mouthpiece for underperforming restaurants like Barluga Morpeth. I read your review about Bar Luga Morpeth in Saturday 31st August journal. Can completely agree with it all. The bar/restaurant was great on opening but then has steadily gone downhill. I complained to the manager and area manager after 3 horrific meals there last year and was offered a complimentary meal but have never returned to redeem it, as it has continued to receive bad reports. Such as shame as its a lovely spot and they could do so much better... Morpeth needs it too, I live in the town centre and we are sadly lacking a very good eatery. Morpeth is spoilt for good eateries, no? Shambles 2nd floor, numerous Italian/ Thai/Indian, great cafes and failing all of that Wetherspoons has a large menu to suit most. Anyway, thanks to Secret Diner for your convictions. Bar Luga is good at polished wooden surfaces, this much I know. And everything else I've always suspected about it was confirmed in the review. Even a poor place gets somethings right, so no need to believe the very worst about it. Though it does sound rather heartless.